The Dunkirk spirit lives on in Cowes! On Saturday afternoon I was waiting to cross the River Medina from East Cowes to West Cowes. The usual crossing vessel, the chain ferry, had over-run it's annual maintenance period and was parked (with nobody working on it), so we were using the alternate Jenny passenger launch. Unfortunately, it broke down and was taken out of service. The spare boat was in Portsmouth, two hours away according to the crew who took away their broken boat and returned some time later with the Cowes Harbour pilot boat to use as a ferry. This can only take 12 passengers and no buggies or prams, so was of very limited value and consequently the queues on either side of the river were growing ever longer. Help was at hand - the local water taxis came to our assistance and a flotilla of little boats were soon running a shuttle service picking passengers off the pontoons and taking them across the river. What do you do on a Sunday in February? Well, if you are on the Isle of Wight, you go for a walk to enjoy the magnificent scenery. 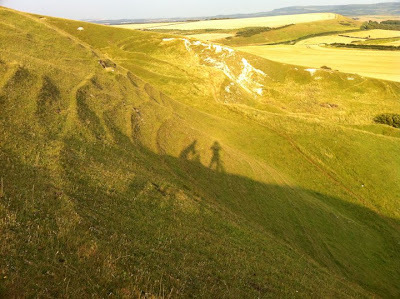 There is so much choice - over 500 miles of waymarked footpaths, beaches, fields, forests and downs. 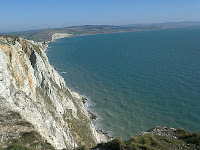 This week we looked at the prevailing wind direction and visibility and decided to go west onto Tennyson Down and walk along to the famous Needles Rocks marking the western end of the island. As we climbed from the chalk pit car park behind the High Down Inn we gained stunning views of the mainland shore and Hurst Castle. At the top by the prominent Tennyson Monument we could see south into Compton Bay towards the southern tip of the island at St Catherines. Compton Bay is one of the UK's best surf spots but we could not see anybody out, I guess the wind was in the wrong direction. 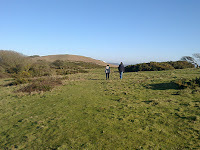 A nice walk with the breeze behind us took us to the old Rocket test site at Highdown. 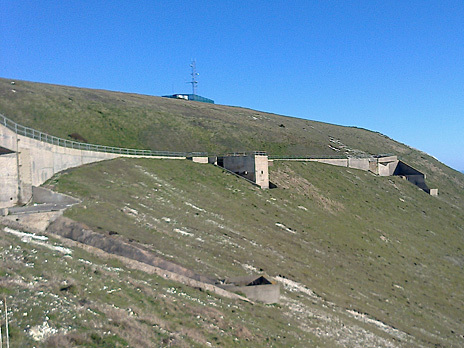 This once top secret site was constructed in the 1950s and was operated until 1971. 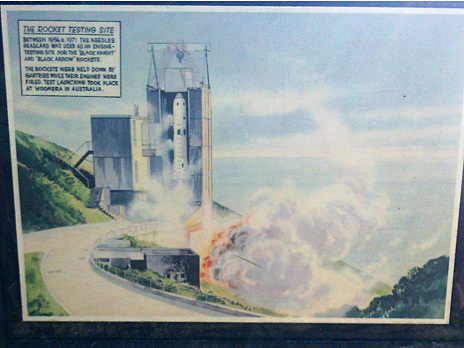 It was used as a ground test firing site for Britain's space programmes. The Black Arrow launcher for Britain's first satellite, Prospero, was tested here and shipped to Woomera in Australia for launch. The satellite was launched in 1971 and is still in orbit now, 40 years later. See where it is right now. 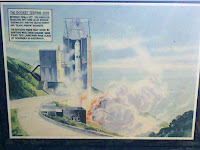 Like many good British inventions and developments the space programme was cancelled as the first satellite launched due the politicians' views that there was no future for a British space industry! There is an information plaque by the old site and a museum with lots of interesting information about this site. 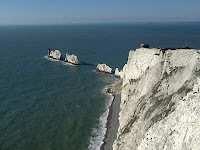 Just past the rocket site is a small viewing platform where you can get magnificent views of the famous Needles marking the western extremity of the island. The current lighthouse was commissioned in the 1860's and replace the original one built in 1786. The lighthouse was manned and serviced by boat, weather permitting, until a helipad was installed in 1987. The lighthouse was fully automated and the last keepers left in December 1994. 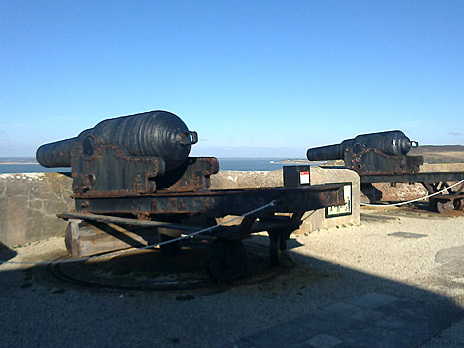 We walked from the gun emplacements at the top of the down to the old Needle Battery fort overlooking the Needles and guarding the entrance to the Solent with it's big guns. This is looked after by the National Trust and an entrance fee is normally payable, but this week it is free for half term. We went in for a most welcome cup of tea and slice of cake to recharge our batteries (sorry). 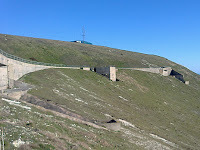 The Needles Battery is mostly run by volunteers and is a very interesting visit with stunning views. 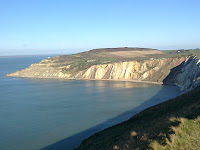 Walking back from the Needles there is a magnificent view of Alum Bay with its famous coloured sands. Tourists from all over the world come here to fill glass shapes with layers of the coloured sands. During the summer boat trips run from here to view the Needles and the sea level gun slots cut into the cliff below the Needles Battery. Marconi conducted his early experiments in radio here and in 1898 he managed to transmit as far as Bournemouth and Poole, 20 miles away. How far have we come with communication since then? Finally, a walk back across the downs to the car. What a great day! Plenty of fresh air and exercise, lovely views and lots of interesting places and things to see. Perfect! 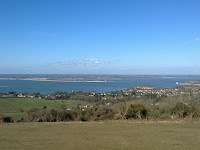 Why don't you come and see our lovely Isle of Wight - it is just as good in the winter and much less crowded. Having been stuck in the office during the beautiful sunshine of the last week in March we were delighted to see Sunday 1st April dawn bright and sunny, if a bit cold. Up early to take full advantage of our day off we set off to Gurnard Sailing Club for the first race of the Spring Series. It was a lovely morning with a gentle breeze and after some close racing Dawn gained top spot on the podium much to her delight. Lunch in the club followed prepared by the all-volunteer crew. What a wonderful club Gurnard SC is. In the afternoon we decided on a walk around the old village of Godshill up to the Worsley monument. We parked in the old village and saw this cat lazing in the sunshine. Then we set off along the footpath behind the Griffin pub. 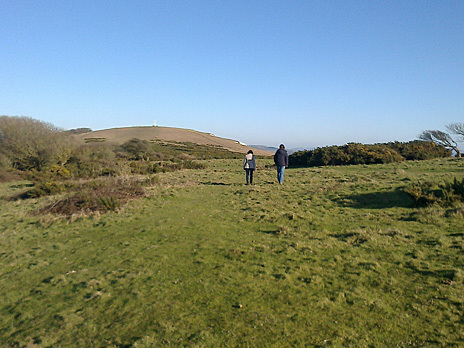 This take you through the meadows and a bluebell wood out onto the lower slopes of the downs. There is a steep climb up the steps but the view is fabulous. Why would you want to go abroad when you have such stunning scenery right here in the Isle of Wight? Almost at the top - do you think we will reach the moon? Back down through the woods past the Freemantle gate to the Appuldurcombe estate. It is very spooky to find this huge structure beside the footpath and it makes you realise how grand the estate must have been on the old days. Then we came to a farm with some rather unusual animals. The Llama with her lovely long eyelashes and the pigs that look like sheep! Finally, back through the Bluebell woods. We just had to have a play on the rope swings and climb the fallen trees. 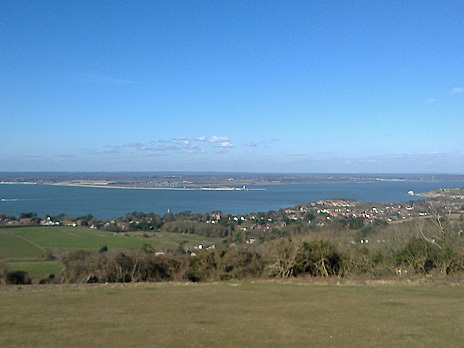 The Isle of Wight is beautiful all year so why don't you come and see for yourselves? February half term is fast approaching, and where better to spend it than on the Isle of Wight? There is certainly no shortage of events happening on the Island throughout February, to keep the whole family entertained. For a great family day out, hop on a train at the Isle of Wight Steam Railway: as part of their half term open week, steam locomotive No. 192 ‘Waggoner’ is running alongside diesel locomotive D2059, taking passengers on a trip through some of the Island’s most treasured spots. If you’re feeling adventurous, you can even get off at Ashey to explore some of the Island’s beautiful countryside. Everyone loves a good story, and Ryde Library is running an ‘I Love You’ story-time for 4-8 year olds on the 13th and 14th February, from 2:30-3:45pm. It’s free, with no need to book, and includes stories, games and a crafts session, making it the perfect, stress-free outing for young families. For all those aspiring explorers, there is a Natural Wight and Wildlife Trust Mini Explorers Day for 8-13 year olds at Bouldnor Forest on Thursday 16th February. The event runs from 10am -3pm, and pre-booking is recommended on 01983 404344. To get a taste of Island history, join Tony Gale as he explores smuggling on the Island at the Classic Boat Museum Gallery in East Cowes. The talk starts at 7pm, and admission is only £2 – a bargain! Step back even further in time and go along to Newport Roman Villa’s ‘Clay Day’ on Wednesday 15th February. It costs just £1 and runs from 10:30am – 4pm; more information is available on 01983 823433. Or go right back to the age of the dinosaurs with the Island’s popular attraction, Dinosaur Isle. Fossil walks are happening daily throughout half term, and booking is essential. If music and entertainment are more your thing, Medina Theatre is offering a wealth of events for every taste. Bookending the half term week are award-winning local group The Wight Strollers with their pantomime ‘Robin Hood and the Babes in the Wood’, a show bursting with live music and laughter for all. There are performances on Saturday 11th, Sunday 12th and Saturday 18th February. Not quite in half term, but definitely worth a mention, are the world’s first and best Fleetwood Mac tribute band, Fleetwood Bac, who are returning to Medina Theatre on Friday 24th February. Endorsed by the legendary Mick Fleetwood, Fleetwood Bac create a mystical atmosphere and on-stage chemistry in a show that is truly magical: a must for all music fans! Whatever your family loves to do, the Isle of Wight promises to delight adults and children alike at half term with its local charm. The Isle of Wight has been named as one of the top 10 destinations in the world for cycling. 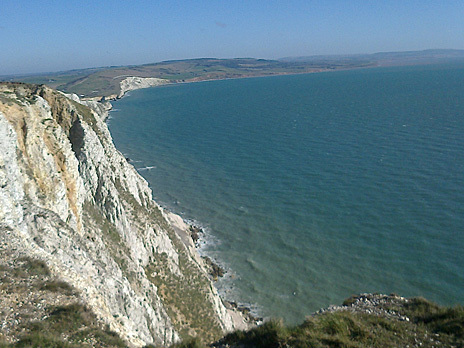 The Isle of Wight is listed alongside destinations including the Otago Peninsula in New Zealand, San Juan Islands in Washington in the USA and the West Coast in Tasmania, Australia. David Pugh, IW Council Leader said "This is very good news for the Isle of Wight, especially ahead of the annual Isle of Wight Cycling Festival which is organised by the council. "We are blessed with stunning views and areas of outstanding natural beauty and, as a keen cyclist myself, I am not surprised the Island has made it into the top 10 destinations of the world." It is not the first time cycling on the Island has been highlighted by national publications. 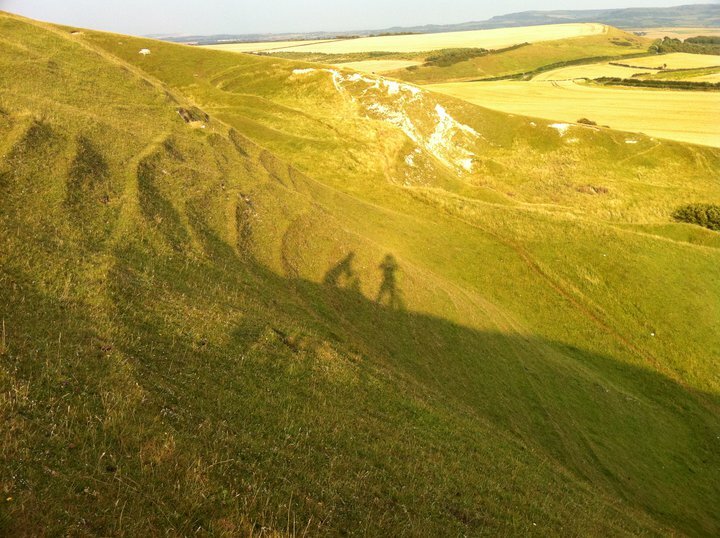 The Good Mountain Biking Guide described the Tennyson Trail as 'possibly the best chalk trail in the UK' while the IW Cycling Festival regularly features in national and international media. This year the festival is held between 17 - 25 September and features over 60 rides, including the popular Hills Killer and Cycle the Wight. We'll see you out on the trails this autumn!